Thank goodness the franchise is back from extinction! Everyone loved the 1993 Spielberg classic of the disastrous dinosaur theme park with the memorable soundtrack by John Williams. The second two movies The Lost World:Jurassic Park (1997) and Jurassic Park III (2001) were unremarkable and sometimes down right painful. This time director Colin Trevorrow (Safety Not Guaranteed) helped write the script with Rick Jaffa, Amanda Silver and Derek Connolly giving homage to the first film with the park, twenty years later is now a successful resort island vacation wonderland. And like it's new dinosaur, it's bigger, louder and has more teeth than the others. 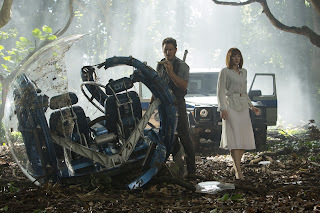 Gray and Zach (Ty Simpkins and Nick Robinson) are being shipped off to Isla Nublar off the Central American coast near Costa Rica to spend a week with their aunt Claire (Bryce Dallas Howard) the park's operation manager while their parents work out a divorce. Except their aunt is too busy with her job to spend time with them, plus she hasn't seen them in seven years. She's trying to impress the new investors on their new “asset” the Indominus rex created by Dr. Wu (B.D. Wong) the chief geneticist from Jurassic Park. The new park's owner is Simon Masrani (Irrfan Khan) who took over from John Hammond. He had set the parameters of the new asset from customer surveys as the regular dinosaurs are getting boring. Meanwhile, ex-Navy Owen Grady (Bill Pratt) is the on-site velociraptor trainer and has impressed Vic Hoskins (Vincent D'Onofrio) who is head of security operations for InGen. Owen has developed a relationship with a group he named Blue, Charlie, Delta and Echo. Hoskins sees this as a potential military weapon. There always has to be a stupid bad guy in the film to gum up the works. Claire asks Owen to check out the holding paddock for the Indominus rex. They went on one date, and the awkward cute chemistry is played out for the rest of the movie. But something is amiss and before you know it, the asset escapes and all hell breaks loose. Suddenly Claire realizes that her nephews having escaped the watchful eye of her assistant is out there near harms way, so she and Owen take off to save them. They see evidence of the Indominus rex's deadly rampage. They not only have to get the boys, but they have to evacuate the 20,000 people in the theme park. Once the action gets going in it will keep you at the edge of your seat. Chris Pratt is the only one who has figured out that asset, due to it's genetic scrabbling is smarter and more savage than anything else out there. It can get kinda gruesome, so careful of the young ones if you allow them to see this. Be warned, lots of people get eaten. Claire is running around in high heels, the boys bond and are resourceful, Hoskins and his military agenda make things worse. Of course it also sets up the story for future films in the series. Which will only work if they include Chris Pratt to save the world. Now he's got “teeth”!